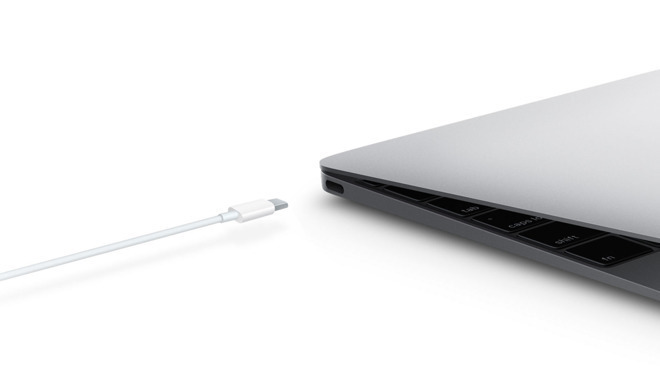 A USB Type-C cable is used to connect to MacBooks. A future generation of USB, the USB Promoter Group revealed the release of the USB 4 specification is on the way, and would effectively offer all of the benefits of Thunderbolt 3. While the implementation of USB 4 by vendors may be a long time away from happening, the draft specification itself is expected to be published later in 2019. The specification is largely expected to cover most, if not all, of what is currently capable under Thunderbolt 3, as chip producer Intel has contributed Thunderbolt 3 to the group. The provision will effectively make it easier for vendors to produce devices using the technology at a cheaper rate than at present, and possibly without any of the current confusion of USB and Thunderbolt 3 connectivity due to using the same USB Type-C connector. The benefits of USB 4 will be largely consistent with Thunderbolt 3, including a throughput of up to 40Gbps, and may include elements such as power deliver of up to 100W, allowing notebooks to be charged over the same connection as driving 4K and 5K displays. The spec will offer backwards compatibility with earlier USB standards, including USB 3.2 and USB 2.0, as well as Thunderbolt 3 itself. Intel has planned to offer Thunderbolt 3 as a royalty-free standard to manufactures for some time, with Monday’s announcement being a culmination of that work. While Apple is already an adopter of Thunderbolt 3, the change will help with the creation of more accessories that will work at the higher connection speeds and have support for the standard, in part due to it becoming more widely available. Indeed, Intel’s integration of Thunderbolt 3 into future processors, including “Ice Lake” chips announced earlier this year, will help further that support. USB 4 would follow after the impending availability of USB 3.2 Gen 2×2, which recently underwent a somewhat confusing name change. That specification will be an upgrade from USB 3.1, now known as USB 3.2 Gen 2, doubling the bandwidth from 10Gbps to 20Gbps.